Ever wonder what crampons are made of? Until recently, most crampons were made with chromoly steel. But now Black Diamond has updated their entire line of crampons to stainless steel, offering a fresh silvery look—and several improvements over previous models. Chromoly steel is harder and stronger than traditional steel due to the use of chromium and molybdenum in its production (hence the name, chro-moly). Like all steel, chromoly also rusts, which is why most crampons are treated with a (black) corrosion resistance coating—not the most eco-friendly manufacturing process. You can watch a video about Black Diamond’s efforts to address these issues here. 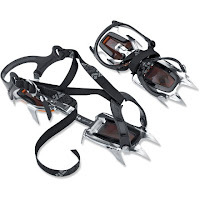 Black Diamond offers five different crampon styles, each designed for a specific use. As is standard these days, they all come with attached rubber plates (ABS plates) to prevent snow from sticking to the underside. 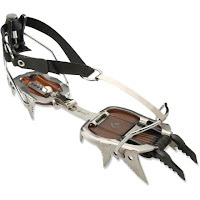 The Contact Strap ($130; 1 pound, 13 ounces; pictured) is probably their most popular, an all-purpose 10-point crampon that fits a range of boot styles. Designed for general winter travel, it’s an excellent choice for most winter hiking adventures in the Northeast. For 2009/10, they’ve increased the flexibility of the center bar, which will make it more comfortable when worn with winter/hiking boots that are less stiff than a rigid plastic or mountaineering boot. The Serac ($160; 2 pounds, 2 ounces) is a beefier, 12-point version of the Contact Strap and would be a good choice for travel over steeper, icier terrain. Its second points are longer, and angled more aggressively, for better traction in steeper conditions. It is also available in a pro, clip, or strap version, depending on whether your boots have a toe bail and heel clip for attachment (both help the crampon fit more securely). The Sabertooth ($170; 2 pounds, 2 ounces) is almost identical to the serac, but features an even more aggressive, double-pointed second point—it’s closer to a 14-point crampon. Black Diamond touts it as their best all-around crampon. Available in clip or pro versions, but you’re out of luck with these if your boots don’t accept a heel clip. The Cyborg ($200; 2 pounds, 7.5 ounces; pictured) is their technical ice- and mixed-climbing crampon. Like any crampon designed specifically for steep to vertical ice, you can recognize it by its vertical front points. The Neve ($150-$160; 1 pound, 5 ounces) is their lightweight, 10-point aluminum version of the Contact Strap. A great option for lightweight and intermittent use. You can read about this and other aluminum crampons in my recent post.